I’ve always loved Blondie/Debbie Harry, her music, her look, and her attitude. She’s about ten years my senior, and she is not retiring from the world. The Tide Is High, Call Me, Heart of Glass – all indelible tunes from my youth. She was pop, new wave, punk, and in-your-face rock, and melded it all together like a boss. 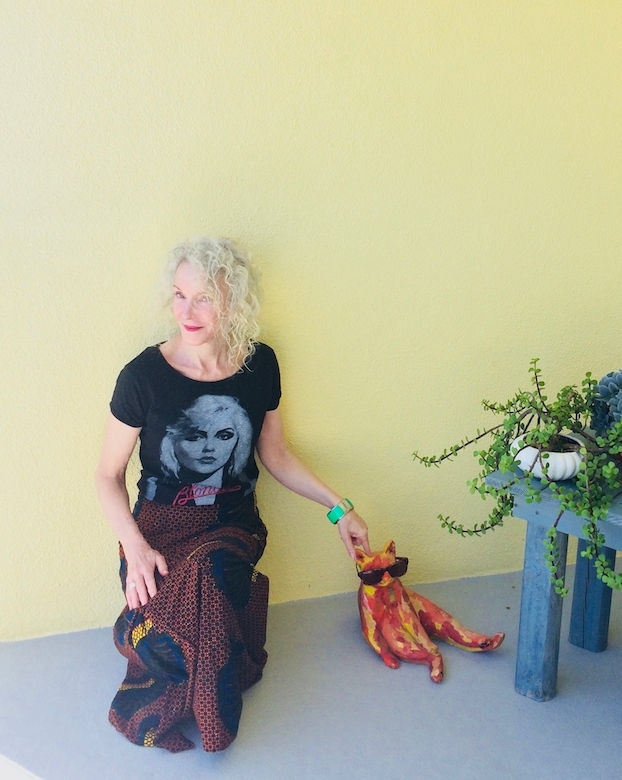 The Blondie tee was thrifted in Toronto, as was the fabulous ethnic print skirt. I love, love the shape of this skirt, and the unexpected print. I think both these pieces set me back about $25 total, after Senior Discount, heh. Thrifting is the way to go for pieces that speak to you. Blondie is the total bomb, feminine and gorgeous and crazy-talented. Blondie doesn’t really “match” my trumpet skirt, but she goes, she truly goes. Blogging for seven-plus years has taught me to mix up my pieces, and to not-fear public critique. I wore my Steve Madden Troopa boots and an old, thrifted green bangle. Rub my ear and I’ll follow you forever. Hi! I was lucky enough to see Blondie at Glastonbury Festival a couple of years ago. She was just as fabulous as you look in this outfit – I love it! The print of that wrap (?) skirt is beautiful and black with brown has an easy sophistication. Patti, there is nothing more rock star than a graphic tee and funky printed skirt. Love Love Love!!! I have a few Blondie memories. One, a classmate at Otis dated Nigel Harrison, the bassist, and all we heard from her was “Nigel this” and “Nigel that”. Annoying. Two, The Smithereens opened for Blondie at the LA County Fair in 2016. Their set was only 20 minutes. Five songs. Backstage, Blondie was gracious to her fans and was willing to take umpteen selfies with them. Adore your African wax-print skirt! I have always loved Blondie. Thanks for sharing, Patti! Fun seeing these two pieces together! Have you taken in the skirt yet? People need to see the fabulous backside! I have done it! But will show the back side on IG later. You’re right, it is fabulous, if I may say so. Well ‘Blondie’ I love this edgy, rocker yet totally achievable and comfy look. The graphic tee and maxi skirt look great together! Very fun look! Any look that includes a Blondie tee is a yes in my book! That is such a great tee shirt, I think it could be paired with anything. Love it!!! Oh I remember the MtV videos… blondie is classic! What a fun outfit. Before you said skirt, I thought it was a pair of wide leg pants. I love the print, and it suits you very well. Fun look! Have a great day Patti! That graphic tee looks great with that skirt. You are always so hip! love the tee, it’s classic as is Blondie. Blondie absolutely goes with that fabulous skirt! You always wow me with your style choices! Magnificent, my friend. Love Blondie … such a cute tee! Love this Patti! 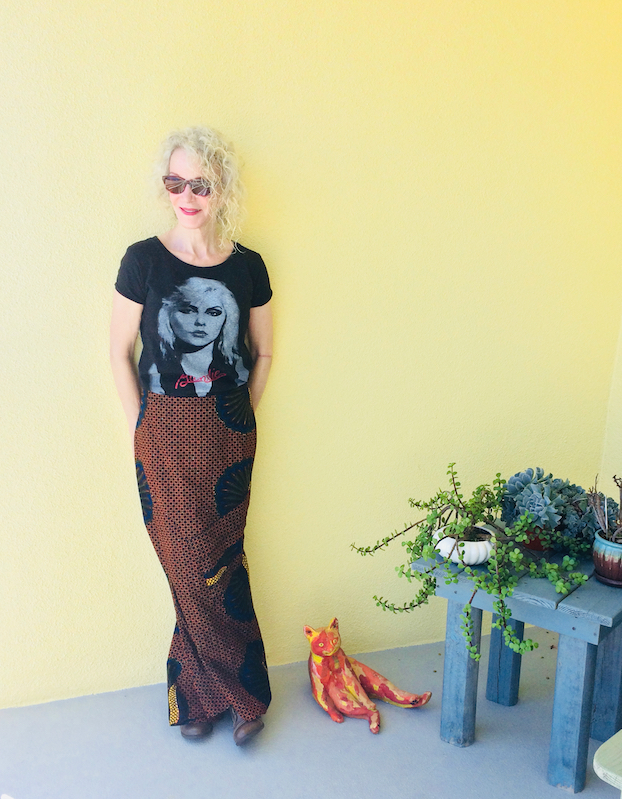 Blondie is fabulous and my Blondie tee is one of my most often worn…and typically with a print skirt. I love Blondie, always have and always will! I’d love to own a tee like that. Love this edgy look Patti! Oh yes, I loved her style! Rapture was a fabulous song! Ah, this fabulous outfit is CALLING ME ! ha! Love the Blondie tee and printed skirt. Better that they work together than match, much more interesting that way. Happy bright week! You really rock this look, Patti. There is DEFINITELY a resonance between you and Ms. Harry. It’s great that you found these cool pieces in Toronto. I don’t know why, but it is. Heh. Thanks for the linkup. So happy I could join. It’s way more fun to combine pieces we love like this than worry about everything matching!!! Love that tee! Blondie has always been a favorite of mine! That tee is awesome – I love Debbie Harry’s style and music! That skirt is really a special piece, and I love how you’ve mixed the punk/casual vibe of the tee with this dressier piece – fabulous! Thanks, as always, for hosting “Visible Monday”, Patti – I’ll be there soon! That ensemble is crazy cool on you, Patti. You are so groovy. You are singing my songs, Patti! Love your look, love that it’s thrifted, and just love that we’re so in-sync with our posts these days. I’ll be linking up with my Blondie post. BIG Blondie fan here as well and you are quite the blonde vision in that killer tee!! LOVE this whole vibe, I literally can hear her in my head now…The Tide is high….